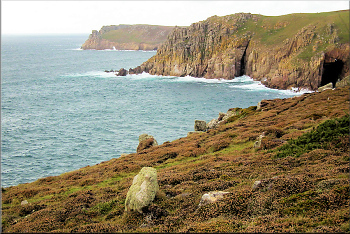 The megalithic era in West Penwith spanned more than two millennia - a hundred generations. This was the longest-lasting civilisation Britain has ever seen. If we go back two millennia from today, we'd be in the iron age, the time of the druids before the Roman conquest of Britain. The megalithic era comprised two main periods of development. The first lasted several centuries in the mid-neolithic, between about 3700 and 3200 BCE. The second lasted at least a millennium, from around 2600 to around 1500 BCE (with its final end around 1200). These two phases were quite different but they worked with similar principles. All the sites mentioned below are covered in greater detail on other pages - click the links for more. The first period, in the neolithic age around 3700-3200, saw the building of the hilltop tor enclosures, the central places of the time in a largely forested landscape. In Penwith these were found at St Michael's Mount, Trencrom Hill, Carn Galva and Carn Kenidjack. 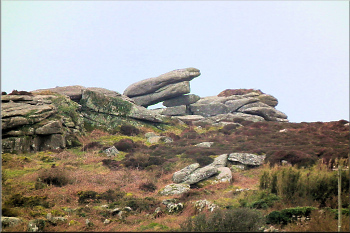 The first such enclosure to be identified was at Carn Brea, above Camborne, east of Penwith and in view of it. There were also notable hilltop constructions at Chûn Castle and Chapel Carn Brea (Britain's south-westernmost hill). Important also to neolithic people were the cliff sanctuaries (cliff castles). This dating is not recognised by archaeologists who, probably correctly identifying their boundary 'ramparts' as iron age in origin (500 BCE to CE 100), reckon incorrectly that the cliff sanctuaries started their careers the iron age. Not so - this is explained on the cliff sanctuaries page. The most remarkable of the megalithic constructions of this time were the quoits (also known as cromlechs or dolmens), all of which are located in the northern, upland part of Penwith, the centre of human activity at the time. In engineering terms, these were the trickiest and most advanced constructions of the whole megalithic period, involving the raising off the ground of enormous multi-ton capstones. Their transportation would have been an enormous challenge too. The quoits were not tombs, as they are often described: they were energy-chambers. Here, recognition of the role of subtle energy in the design and building of ancient sites yield answers that otherwise are left to a mixture of guesswork, tradition and error in interpretation. 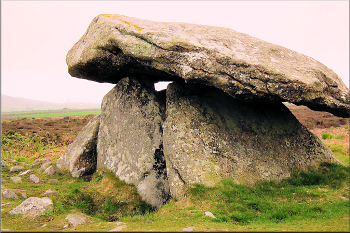 The neolithic also saw the erection of placed, propped and oriented stones. Many (though not all) of these come from the mid-3000s BCE. Placed stones were rocks moved short distances to install them in interesting, rather artistic locations, as if to enhance nature's enchanting visual magic - rather like a prehistoric art installation. 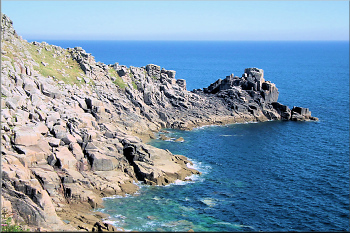 Little were neolithic Penwithians to know that, 5,500 years or so later, their home area was to become famous as a centre for artists (St Ives and Newlyn). Propped stones were rocks that were raised up, often at one end, with one or a few small stones placed underneath them to keep them raised. What their purpose was, we do not know. Purposes could range from a simple sense of humorous artistry, to some sort of method for empowering rocks or carns, or to create a 'viewbox' highlighting the view beyond. Later, in the bronze age, some menhirs were propped up too (an example is the gateway stone at the entrance to the cliff sanctuary at Carn Lês Boel). Oriented stones were rocks with at least one flattish edge, dug into the ground to stand vertically, with the flattish edge oriented toward another site (such as a hill or a headland). 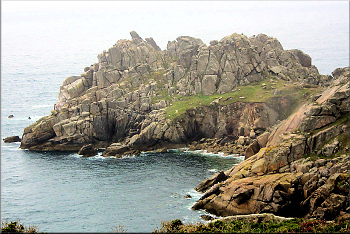 This highlights that feature or creates a link between the place where the rock stands and the place it's pointing at. 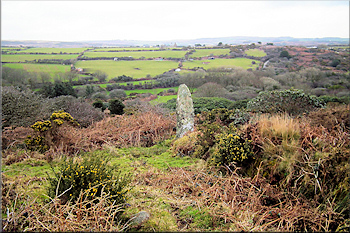 On the right is a classic, a small stone at Carn Trevean (SW 3611 2291), oriented toward the tip of Carn Lês Boel and aligning with a nearby twin stone just down the slope. Around 2500 BCE, things changed. The indigenous culture of the late neolithic was already developing new ideas and a new class of ancient sites had gradually been appearing across Britain in the preceding centuries. New ideas and people were also entering Cornwall from Brittany and Iberia, bringing with them new knowledge and ideas, as well as knowledge in working in copper and, later, bronze. The 'Beaker influx' is so named after a characteristic style of drinking beaker these people brought with them (they brought social alcohol drinking too). They were forerunners of the Celts and, with their arrival, the bronze age lifted off. 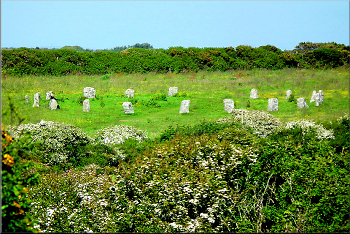 The megalithic era took on a new shape and, over the following centuries, a profusion of stone circles, menhirs, cairns and barrows, hilltop enclosures and other sites were built. The principles developed in the neolithic were further developed, with more science and system involved. The neolithics had already intuitively located their sites on top of energy-vortices that are generated by blind springs and intersections of underground water lines, as well as making use of astronomical, landscape and other factors that were further applied in the bronze age. 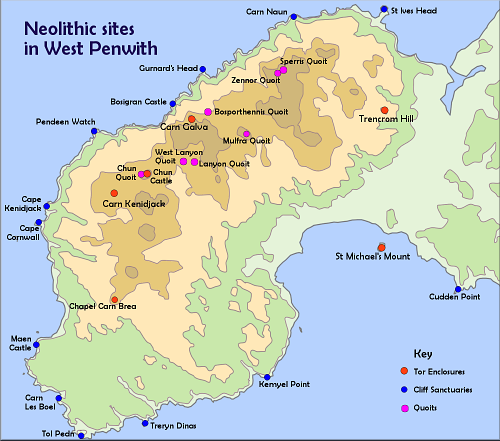 The people of the early bronze age turned these principles into a large-scale project covering the whole of the Penwith peninsula - and they turned it into a science. They did this by expanding the principle of aligning ancient sites, incorporating this method with all the sites they built - every single site was located in a dead straight alignment with other sites. This was not systematic and orderly in the way we moderns might design if we were building a similar system - there was a naturalesque, organic evolution to the way they did it, using established principles but without a logical master-plan. 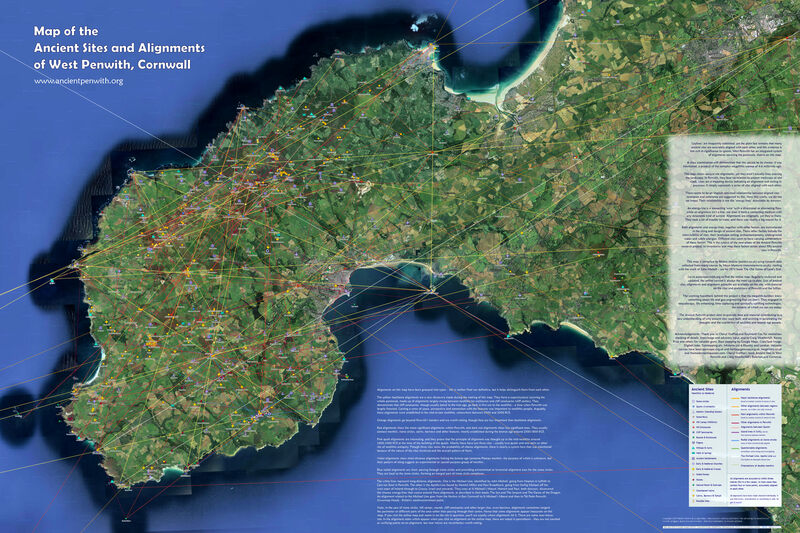 You can see this if you examine the alignments map of West Penwith. So what is all this about alignments? Much criticised, disregarded and discredited, this phenomenon, first popularised in the late 1960s and dubbed 'leylines', is not just a fancy idea - it is based upon hard evidence. All of the alignments on the alignments map (with just a few exceptions) are accurate to within just three metres, on alignments stretching many miles. They are easy to check and solidly evidential. Their crucial importance in the design and location of ancient sites is wilfully overlooked, and their capacity to shed light on the purpose and meaning of megalithic sites is enormous.